You can decide to follow the typical tourist paths or be brave enough to go off the beaten tracks. One way or the other, Rome will romance you, surprise you and leave you with wanting more! Whether you spend your time sightseeing, or watching the world go by in a pretty outdoor cafe, it will be your turn to feature in your very own Roman Holiday. It's important to consider the down-sides when visiting any city. We have put together a list of some things you should avoid when visiting Rome. Exploring, discovering and experiencing cultures and lifestyles around the Globe is a great gift that has been given to humankind. It has never been so easy to travel as we experience it now. All is there at our disposal and we can touch it with almost making an effortless effort. The question that arises is the way we touch it. We, people engaged in Rome.info travel pages believe that one should treasure this opportunity and blessing of travel which is given, and treat it with respect and kindness. A visitor should be lovingly committed to making a low impact on the local culture and environment, protecting privacy and space in life of locals, and reward an invitation to their lives with gratitude and frolic. Sharing inspiration. While people like us on the other side are trying to help to ensure that development is a positive experience for local people; companies; and tourists themselves. Sustainable tourism is regarded as responsible behavior and visitors to our pages are invited to embrace this attitude when travelling in Rome. It is more than a form of tourism as it represents human approach to engaging with cultures, local magic, be there as a human being - tourist, a business, locals at a destination or any other tourism stakeholder. "Hearts are like parachutes, they only function when open." Explore the work of a genius with Rome.info. 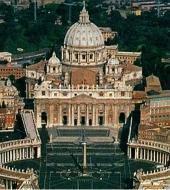 Paintings, sculptures, frescoes and other of Michelangelo's masterpieces related to Rome.